Please see the "Resources Page" for a detailed explanation of procedures and expectations. *Social Studies Textbook: The United States: Making a New Nation. Houghton Mifflin Harcourt, 2012. 5.2b Complex societies and civilizations adapted to and modified their environment to meet the needs of their people. o What were some of the most important things that we learned about last week during our Exploration unit?o Who were some of the people we learned about? Explorers, conquistadors, etc.o Tell students that throughout the next couple of weeks, we will be discussing new people and the early settlements that began to form in North Americao Students will watch https://www.youtube.com/watch?v=6M5kKo_OmO0 to go over what a colony means. Students will learn about the first settlement in the New World: New Spain. Who were some of the people that helped establish the new territories? What countries claimed land in North America? Students will look at the map on page 2. What would be different if the Europeans decided not to settle in the Americas? What would some negative and positive things be? How would you feel if you were a powerful ruler and you sent explorers to find land? Would you be happy? Scared? Both? Why? Students will be given a graphic organizer that will allow them to categorize the settlements, people, places, and interesting facts. 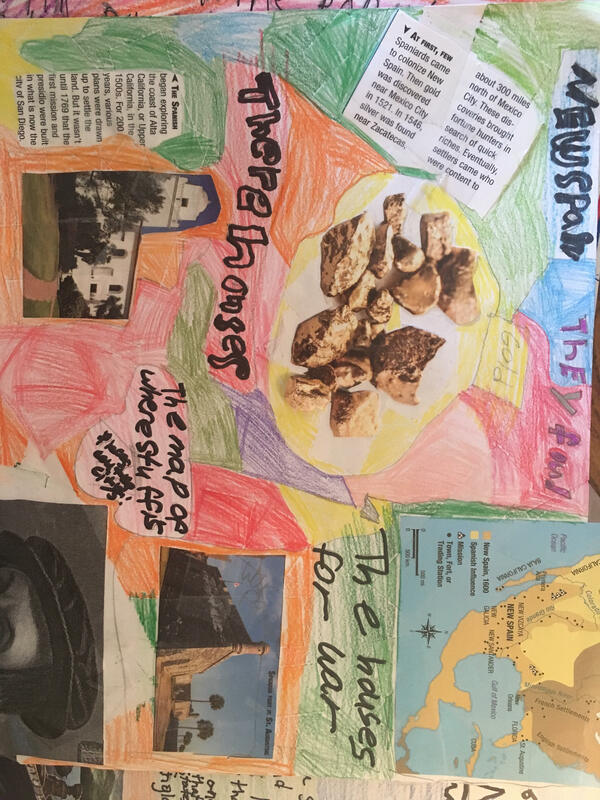 Students will know that they are working towards making an advertisement for a settlement in which they want people to go visit. Miss Morris wants to make sure that the students are completely prepared for the assignment before students begin to work independently. Are students able to correctly find and explain the key concepts that were taught during this lesson? Are students able to complete the skill that has just been taught to them? Who were some of the people and facts that you recorded on your graphic organizer? As a class, we will read “pages 8 and 9 together through pair reading, volunteers, and following along. Students will be given a graphic organizer that will allow them to categorize the people, places, settlements and fun facts of the Virginia Colony. Are students aware of the different people, places, and interesting facts about the Virginia Colony? Students will be required to fill in the missing information from their graphic organizer for homework if they do not finish in class. o Students will be told that they are learning about a new colony today. The name of the colony is Plymouth Colony.o Have you heard of this before?o Students will be asked what comes to mind when they think of the Mayflower. We will share answers as a class. Students will learn about the next settlement in the New World: The Plymouth Colony and their journey to the New World. Students will be able to identify and categorize the different people, places, locations, and interesting facts surrounding the Plymouth Colony settlement using various sources. What was important about The Plymouth Colony? What happened in this colony? Who were some of the important people that helped shape society and our world? Would you choose to make the journey on the Mayflower? Why or why not? This will be done after the students watch the Mayflower videos and are broken into smaller groups. Miss Morris will tell students that yesterday we learned about the Virginia Colony and the mystery of Roanoke. Today, we will be learning about our 3rd colony: The Plymouth Colony. Miss Morris will have this written on the board. Miss Morris will read “the Plymouth Colony” to the class and ask them to be looking for and annotating the name of the settlement, the people involved, the location, and some interesting facts. We will discuss that later in the class. Miss Morris will then write the word “Mayflower” on the board. Students will be asked to think of what comes to mind when they hear that word. We will create a word web together on all of our thoughts. If no one has said the word ‘ship,’ Miss Morris will show a picture of the ship. This should guide students towards what we are learning about. https://www.youtube.com/watch?v=7o5k-W3j1mM to understand what the Mayflower consisted of. Students will be asked to be thinking about whether or not they would like to journey to The New World on the Mayflower. Once the video is over, Miss Morris will ask groups to share their thoughts with one another. Would you like to have traveled on the Mayflower? Why or Why not? Once this discussion is done, we will fill out the next section of the graphic organizer together. This will be “The Plymouth Colony” section that Miss Morris read out loud. As a class, we will write down the name of the settlement, the people, location, and facts. Students will be given a graphic organizer that will allow them to categorize the people, places, settlements and fun facts of The Plymouth Colony. This will be given at the beginning of the week and students will be asked to fill it out as we progress through the magazine. Once we fill this section out together, students will be asked to read through the rest of it on their own and complete the information on the rest of the sections. This is homework if it is not finished in class. Are students aware of the different people, places, and interesting facts about The Plymouth Colony? o What colony did we learn about yesterday? The Plymouth Colony. Who were some of the people and facts that you recorded on your graphic organizer? Tell students that throughout the next couple of weeks, we will be discussing new people and the early settlements that began to form in North America. Students will engage in their magazine and identify what a colony is. What was important about The French Claims? As a class, we will analyze and read pages 14 and 15 through volunteer, pair reading, expert groups, and following along with Miss Morris reading aloud. Students will be able to analyze pictures and content for the French Claims. Students will be asked to do a quick write in a think, pair, share order to discuss the differences in the way the the French and the Spanish treated the enslaved American Indians and the Africans. What was similar? What was different? 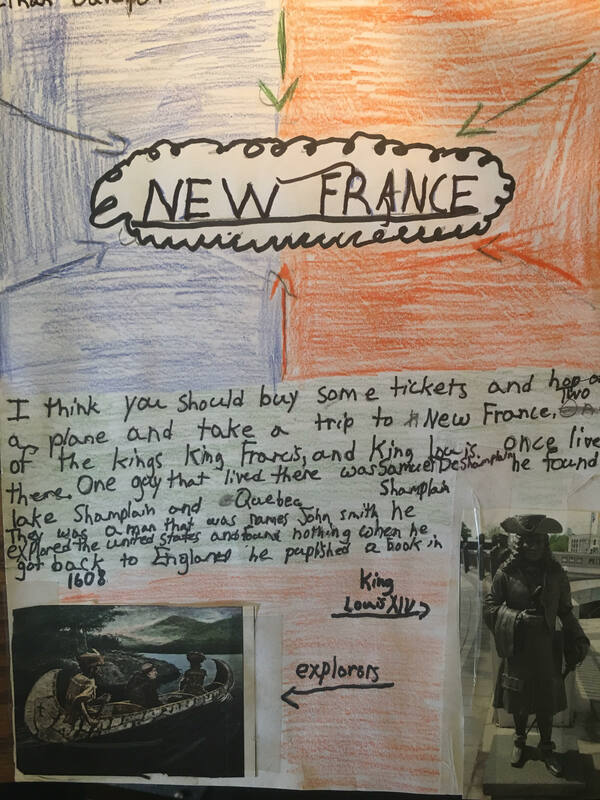 Students will be given a graphic organizer that will allow them to categorize the people, places, settlements and fun facts of The French Claims. This will be given at the beginning of the week and students will be asked to fill it out as we progress through the magazine. Students will be assessed on their active participation throughout the class and their engagement with the text. This will count as a participation grade. Students will be asked to complete an in-class graphic organizer about each colony developed in The New World. For this lesson, it will be The French Claims. What was important about The Dutch Claims? Students will watch https://www.youtube.com/watch?v=CsEovGBFAtA that discusses New Netherlands and New York today. As a class, we will analyze and read pages 16 and 17 through volunteer, pair reading, expert groups, and following along with Miss Morris reading aloud. Students will be able to analyze pictures and content for the Dutch Claims. Students will be given a graphic organizer that will allow them to categorize the people, places, settlements and fun facts of The Dutch Claims. This will be given at the beginning of the week and students will be asked to fill it out as we progress through the magazine. Students will be asked to complete an in-class graphic organizer about each colony developed in The New World. For this lesson, it will be The Dutch Claims. o What settlements have we learned about for the past 2 weeks? What were some significant people, places, and facts in each of those settlements?o Use graphic organizer to help answer the questions. Students will create an advertisement in which they will convince people to come to a settlement of their choice to live. Students will use the information they have gathered from the magazine and from outside resources to develop a creative advertisement. What are some facts that would make people want to move to this settlement? What settlement would you choose to live in? What would be different about your settlement and the area that you live in now? Students will be handed out directions for this project. As a class, we will look up various pictures of advertisements in order to give students an idea of what their poster could look like. Are students aware of the different people, places, and interesting facts about settlement that they have chosen? Do students understand what an advertisement is and what they purpose of this assignment is? Students will be assessed on their effort and accurate information on the advertisement. we will spend a few days finishing typing up our narrative writing assignment during social studies class. Homework due Friday, Monday, and Tuesday, December 1, 4, and 5, 2017: Students will continue typing the personal narrative small moment story that we have been working on in class. Today's lesson will be a continuation of Monday's lesson. See above for more details. We will review the plot diagrams that the students have created. We will watch a video (see above for videos) that will help explain and give examples of the different steps in the Plot Diagram. The other videos are available for students to watch on their own if they need more examples or explanations. Students will be sure to have ideas and details for each of the seven steps of the Plot diagram. We will focus on hooking the reader in our introduction. We will listen to and read examples of hooks that other authors have written. Students will ask themselves, "What have other authors done that I can do? Students will continue typing the personal narrative small moment story that we have been working on in class. Homework due Tuesday, Wednesday, Thursday, and Friday, December 5, 6, 7, and 8, 2017:The following tasks are due on Friday, December 8, 2017. Students will chose 5-10 of the most important facts that they will present to the class. Students will answer the READING CHECK QUESTIONS that are found at the end of each section. Students will only answer the READING CHECK QUESTIONS at the end of the lesson that was assigned to them. See below for details. When students have finished writing down their 5-10 interesting facts and after the READING CHECK QUESTION that has been assigned to you is completed, draw a picture that explains the most important facts about your colonies. SS.CC.5.3: Various European powers explored and eventually colonized the Western Hemisphere. This had a profound impact on Native Americans and led to the transatlantic slave trade. Quick review of the explorer chapter. Question: After the explorers claimed the land that they "found" what do you think happened next? Students will compare the two in terms of purpose (why), people (who), period of time (how long). Examples: As a class, list some examples of experts. Critical attributes: As a class, list some critical attributes of an expert. Definition of concept: What does it mean to be an expert? Students will analyze (examine carefully, breaking it into components to understand it) the colony that they have been assigned. Students will describe the colony. Students will explain why the settlers set up the colony. Students will identify the important points of the lesson. Students will list the main points of the lesson. Mrs. Looney will explain how students will identify important points of the lesson that they have been assigned. Mrs. Looney will model how to chose five facts that are essential for that lesson. What was I thinking when I...? How did I remember...? How did I decide to...? Why did I...? How did I know...? Students will read the lesson that is assigned to them in the social studies textbook. See below for colony assignment. Students will write down 5-10 of the most important facts about their colony. They will present these facts to the class. Students will draw a picture that explains the important facts about their colony. Students will write down 5-10 of the most important facts about their colony. You will present these facts to the class. WHAT TO KNOW QUESTION: Why did Spain set up colonies in North America? Read: The Spanish Colonies, pages 148-153. In your social studies notebook, write down 5-10 of the most important and interesting facts about your colonies that you will present to the class. Answer the READING CHECK QUESTIONS found on pages 149, 150, 151, and 152. When you have finished writing down your interesting facts and after you have finished answering the READING CHECK QUESTIONS, draw a picture that explains the most important facts about your colonies. WHAT TO KNOW QUESTION: Why did English settlers come to North America, and where did they settle first? Read: The Virginia Colony, pages 154-159. Answer the READING CHECK QUESTIONS found on pages 155, 156, and 158. WHAT TO KNOW QUESTION: Why did the English settle in New England? Read: The Plymouth Colony, pages 162-169. Answer the READING CHECK QUESTIONS found on pages 163, 164, 165, and 167. WHAT TO KNOW QUESTION: Why did the French and Dutch set up colonies? Read: The French and the Dutch, pages 170-177. Answer the READING CHECK QUESTIONS found on pages 171, 173, 174, and 177. Homework due Thursday, December 14, 2017: Be prepared to present your information about your group's colony. Presentations will be Thursday. Classwork, Wednesday, December 13, 2017: In the small "colony" groups, students will write the three of the most important ideas that they will teach to the class on computer paper. Students will prepare within their group how they will present their information to the class. Homework due Friday, December 15, 2017: None. Classwork, Thursday, December 14, 2017: In the small "colony" groups, students will present three of the most important ideas that they discovered about their colony to the class. Students will present their pictures and bulleted posters to the class. Homework: Complete drawing that was started last week. Complete quiz. The quiz will consist of at least 10 questions or tasks. See below for details. Students will draw a picture that explains the important facts about their colony. Most students are almost finished with this drawing. Students will create a quiz that will be given to their classmates. The quiz will consist of at least ten questions. Students may ask multiple choice questions, matching, true or false, fill in the blank, short answer, or a crossword. Students are NOT to create a word search puzzle. The information for the quiz will come from the colony section in the text book that they have been assigned. “European countries made several attempts to colonize the New World. Using the information from Chapter 4, choose one colony and write an essay describing how this area was settled, what challenges the colonists faced, and how the colony was able to survive”. · Answer this question in a five paragraph essay. · This must include an introduction, three body paragraphs, and a conclusion. Each paragraph should contain at least five sentences. · Use your social studies textbook and classroom notes as a resource to answer this question. · You will be graded on completeness, spelling and grammar, as well as how well the question was answered. Classwork: Complete your rough draft in your notebooks to edit in class. Classwork: Complete your three body paragraphs (in your notebook) on the assignment essay topic due Monday. Complete your graphic organizer on the assignment essay topic due on Monday. Write your introductory paragraph in your notebook. Write a five paragraph information essay about any topic in Chapter 4 of our Social Studies book. You may write about the Pilgrims but it must be a different essay than the Pilgrim Life essay. Be sure to have an introduction, a conclusion, and three body paragraphs (if not more!). Be sure to include facts, details, and definitions to make your piece more interesting and easy to understand. Remember what audience you are writing this piece for and what you might need to explain for them. This assignment will be worth up to 100 extra credit points. Using your expert graphic organizers that we made in class, write a five paragraph essay about your topic. Be sure to have an introduction, a conclusion, and three body paragraphs. · You are to write a five-paragraph essay about Pilgrim life. · There must be an introductory paragraph and a conclusion and at least three body paragraphs. · Pick your body paragraph topics from your graphic organizer. · You may write about one different topic about Pilgrim life in each body paragraph or write all three body paragraphs about the same topic. · Use your textbook, your graphic organizer from class, your notes, and books about the Pilgrims from around the classroom to complete your essay. Use this graphic organizer to help you complete your Pilgrim essay. Save this piece. We will work on it to turn in for a final draft later. Write this rough draft in your writer's notebook. Classwork: "How to" Essay. See below. Due : Homework: Begin brainstorming all of the details that are involved in the topic that you have chosen. Students will brainstorm a list of all of the topics in which they are experts. Make a time-line or bullet point list of all of the steps involved in your topic. Homework: Chapter 4, Lesson 1 vocabulary found on page 148. Put the vocabulary term on one side of the card, and the definition on the other. If you do not have index cards you can write out the vocabulary on paper. Also, students are encouraged to make corrections to their social studies test that was handed back in class today. Students are to find the correct answer in the social studies text book, change the answer on the test, and write the page number from where the correct answer was found in the social studies textbook. Today we will be discussing and learning about the difference between and expedition and a colony. For homework students will complete Chapter 4, Lesson 1 vocabulary cards found on page 148 of the textbook. Put the vocabulary term on one side of the card, and the definition on the other. If you do not have index cards you can write out the vocabulary on paper. Homework: Chapter 4, Lesson 2 vocabulary found on page 154. Put the vocabulary term on one side of the card, and the definition on the other. If you do not have index cards you can write out the vocabulary on paper. Today we will be working with our Guided Notes Sheet. The purpose of these notes is to help students think about the bigger questions each chapter of our social studies textbook is having us ponder and answer. We will complete these notes together as a whole class with Miss G displaying our collective work up on the board. We will be starting on page 149 of our textbook and getting as far as 152. A copy of those notes will be uploaded below once we complete them in class. For homework, complete Chapter 4, Lesson 2 vocabulary found on page 154. Put the vocabulary term on one side of the card, and the definition on the other. If you do not have index cards you can write out the vocabulary on paper. Homework: Chapter 4, Lesson 3 vocabulary found on page 162. Put the vocabulary term on one side of the card, and the definition on the other. If you do not have index cards you can write out the vocabulary on paper. We will be working individually today on these notes, picking up on page 151 where we left off yesterday. For homework, students will complete Chapter 4, Lesson 3 vocabulary found on page 162. Put the vocabulary term on one side of the card, and the definition on the other. If you do not have index cards you can write out the vocabulary on paper. Homework: Chapter 4, Lesson 4 vocabulary found on page 170. Put the vocabulary term on one side of the card, and the definition on the other. If you do not have index cards you can write out the vocabulary on paper. We will be working individually today on these notes, picking up on page 153 where we left off yesterday. For homework, students will complete Chapter 4, Lesson 4 vocabulary found on page 170. Put the vocabulary term on one side of the card, and the definition on the other. If you do not have index cards you can write out the vocabulary on paper. Homewor: Read Chapter 4 Lesson 2, pages 158-159 using Post-it notes. This strategy involves students placing at least two Post-it notes on each page and putting a question they have about the page on each Post-it note. For homework, read Chapter 4 Lesson 2, pages 158-159 using Post-it notes. This strategy involves students placing at least two Post-it notes on each page and putting a question they have about the page on each Post-it note. Homework: Read pages 166-167 and do a RACE organizer on the question, "Why did the relationship between Native Americans and colonists change?" Today in class we will be reading through pages 162-165 and doing sticky note questions as we read. There should be two per page. For homework students will read pages 166-167 and do a RACE organizer on the question, "Why did the relationship between Native Americans and colonists change?" See the top pf this page for RACE organizers. Homework: Study for FRIDAY'S TEST by reviewing your study guide. Today in class we will be reading together from our textbook pages 170-178 as a whole class. For homework, students need to study for FRIDAY'S TEST by reviewing their study guide. Today we will will be playing Jeopardy to review for our test tomorrow. For homework, study for your test tomorrow. Today we will be taking a test. Homework: Correct tests for half credit if you wish to do so. Students will receive back their explorer tests. Students have the opportunity to correct their tests for half credit but I need to see the page number where they found the correct answer in their textbooks. Today we will be starting chapter four! We will be learning about the Spanish Colonies! So exiting! As a class we will be reading section one of chapter four. We will complete guided notes as we read the section. Students will learn the importance of being able to take notes as they read a text. We will learn about the first Spanish Colonies. Homework: Read pages 157-158 and complete the guided notes for section two. Students will hand in their corrected explorer tests. As a class we will go over the correct answers. As a class we will be reading section two of chapter four. We will complete guided notes as we read the section. Homework: Read pages 166-167 and complete the guided notes for section three. Students will continue to use guided notes as we read section three of chapter four. As a class we will read each section of section three. Pages 163-165. Students will complete the guided notes for chapter four, section three. As a class we will complete the guided notes on the Smartboard and students will complete guided notes on their individual guided notes papers. Homework: Read page 174 and complete the guided notes for section four. As a class we will read each section of section three. Pages 1171-174. Students will complete the guided notes for chapter four, section four. Spend time this weekend studying your notes, your textbook, and your review sheet in order to prepare. The test is on material from pages 148-177. Complete the review sheet for the Chapter 4 Test. Here is the link to the website we used for our webquest in class. Answer these questions on loose leaf paper with at least 2 sentences for each. Use you textbook and notes as a resource. 1. How did William Bradford help the Pilgrims and Plymouth to survive and grow? 2. How did Tisquantum help the Pilgrims and Plymouth Plantation survive and grow? · Read pages 165-167 in your social studies textbook. 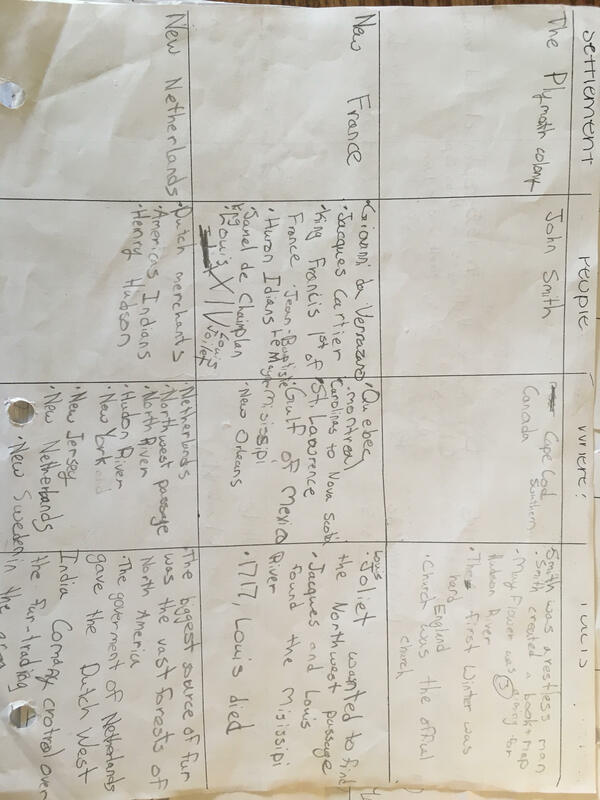 · Take notes on these pages in your social studies notebook. · Notes should be at least a page. · There should be at least two facts written for each section. · Refer to the “Notes” PowerPoint as well as notes taken in class for additional guidance. 1. Why did the Pilgrims leave England for the New World? 2. Why is the Mayflower Compact historically significant? Why does it matter to us? · Read pages 162-164 in your social studies textbook. · Notes should be no longer than a page. All students who received a 75 or less are required to make test corrections. All students may make test corrections if they wish. Using your textbook and class notes write a sentence explaining why the right answer for each question is correct. This must be at least two sentences. One to tell what the right answer is and another explaining why. You must include the textbook page number. Test corrections that include two sentences and the page number where the correct information was found will receive a grade with half of the point value they lost added back. (i.e. a score of 70 will become an 85). If corrections are not done properly students will not receive credit. · Read pages 155-158 in your social studies textbook. · Using your textbook or dictionary as a resource, look up the definitions of each of the vocabulary words. You will have 6 definitions. Please WRITE THEM IN YOUR SS NOTEBOOK. · Write a sentence PERTAINING TO SOCIAL STUDIES for each of the words on the list. You will have 12 sentences. Please write these on loose-leaf paper. · This assignment is for a grade. You will get one extra bonus point for each sophisticated word that you utilize in your sentences. You will lose one point for each spelling or grammar mistake in each sentence. You will lose five points for each social studies vocabulary word that is not used properly or that is not used in a sentence pertaining to social studies. Social Studies Extra Credit! 100 extra points! Bring back a note from the presenter to receive the extra points.